Our cats bring us unlimited joy and happiness with their jumping and prancing, but at the same time, their joints take a beating. More use of muscles and joints can only mean one thing joint related health problems like ACL anterior cruciate ligament) tears and osteoarthritis. Arthritis in cats is not very common, but it makes sense to be well prepared with all the information so that we can make our tabbies comfortable if their joints do get afflicted. Arthritis which is also known as osteoarthritis or degenerative joint disease causes inflammation and pain in the joints. Developmental: things like hip or elbow dysplasia where the joint does not develop correctly. Less active or unwilling to do specific activities. Might have difficulty getting on the couch, stairs or getting into a vehicle. Generally, size and weight is a precursor for this problem thus making larger breeds more susceptible to joint-related issues. To make the correct diagnosis your vet will conduct a medical exam, X-rays, and other diagnostic tests to find the cause of the inflammation. Manage the weight of your cat as with extra weight the chances of muscle problems increases. Get a yearly medical done for your cat. 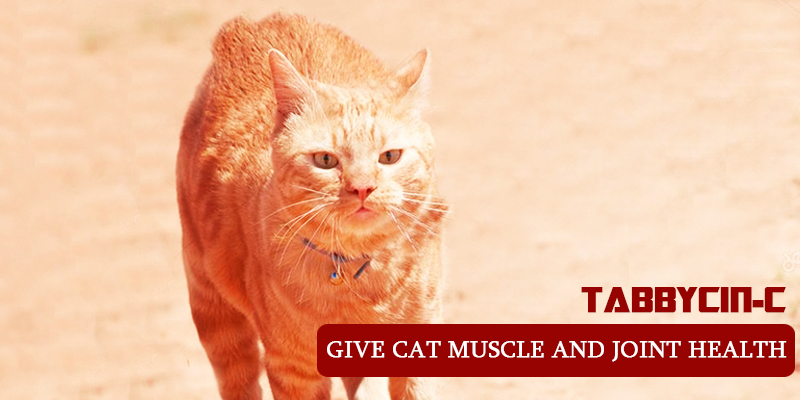 Give your cat’s muscle and joint health that extra boost by getting Tabbycin-C from Bagdara Farms. Tabbycin-C is 100% organic thus it does not have any side-effects like the other over the counter medications. Movement of immune cells to the area of injury and pain. Curcumin in Tabbycin-C regulates COX enzymes thus curbing inflammation and preventing the spread of many diseases. Curcumin in Tabbycin-C is also known for its anti-microbial and anti-fungal properties. Tabbycin-C provides instant relief from painful muscle cramps owing to the analgesic property of curcumin. The best part of giving Tabbycin-C to your cat is that it helps maintain a healthy weight which is the first step towards managing symptoms. Tabbycin-C also protects the bones from any erosion and degeneration brought on by arthritis and also prevents thickening of synovial fluids responsible for lubricating the joints. This fantastic product also prevents progression of osteoarthritis by preventing loss of bone tissue. It is scientifically proven that Curcumin strengthens the immune system thus making it robust to fend off all medical issues. Tabbycin-C can be mixed with a pinch of black pepper powder and boiled with milk and given to the cat daily twice as per the dosage prescribed above. In your zeal to give your feline buddy, the best don’t forget that all good things come in small packages so begin with a low dose and then gradually increase the dosage. Few months back, my cat started walking with a limp and used to be lying down most of the times. Took her to the vet and the worst nightmare came true. She had started getting arthritis and in extreme pain. While I was looking for a long term solution for the problem, I came across Tabbycin-C which claimed multi health benefits to the cats and how true it was. Kitty started feeling better and became active with regular use! Cats are lactose intolerant and get diarrhea when given milk therefore your boiled milk suggestion is a bad idea. Also cats do not like pepper. Ma’am all cats are not lactose intolerant and we have done our study and that is how we have prescribed the dosage according to the size of the cat. Also, pepper is optional and our customers are always guided with various ways of taking the curcumin supplement other than taking it with milk.